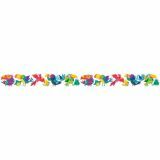 Add creativity and fun to bulletin boards, hallways, walls, projects and more with Eureka Paper Cut-Outs. 36 pieces per package, 12 each of 3 colors. Each cut out measures 5.5"W x 5.5"T.
Add a finishing border to your displays, windows, doorways or chalkboards. Vibrant colors plus a variety of styles and themes can add creativity to displays, windows, chalkboards and more. 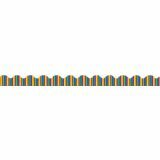 12 strips per package each measure 3 1/4" x 37" for a total of 37 feet! 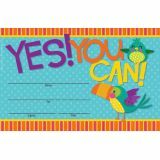 Teach and encourage positive behaviors and responsibility in your classroom with a 20 piece Mini Bulletin Board Set. 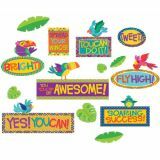 Set includes: 8 Motivational Headers (ranging in size from 21" x 6" to 7.9" to 5.5"), 6 Bird Characters (ranging in size from 3.7" x 3.3" to 6.4" x 5.7" and 6 Leaf Cut-Outs (ranging in size from 8.6" x 5.7" to 3" x 2.8"). 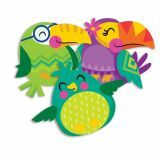 Recognize students' achievements, hard work and birthdays with bright, colorful Recoginition Awards. 36 identical awards per package. Individual award measures 8 1/2" x 5 1/2". 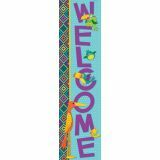 Greet your students and classroom visitors with a warm welcome using School Banners! Banner measures 12" x 45". 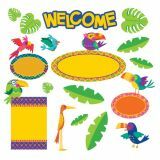 Give your class a warm welcome with this 21 piece Bulletin Board Set. Set includes: 1 Welcome Sign 23.4" x 6.3", 1 Blank Poster (measuring 17" x 24"), 3 Round Decorative Frames (ranging in size from 23.6" x 9.9" to 11.9" x 8.1"" in diameter) and 16 Various Die-Cut pieces (ranging in size from 5" x14.8" to 3.8" x 3.5").